• Can you tell a little bit about your own background and history and how you came to be interested in this issue? • I am a Mangalorean Konkani Catholic. I am a social activist and was active in the Church also. For a long time I have noticed some mismanagement in the funds of the Church. I started digging I found something is wrong at the base. About Inquisition I had heard of a long time ago but I did not know that Francis Xavier was behind it. We venerate and consider him a saint. I was shocked to find that Francis Xavier was behind it. I started digging and found there is enough evidence for this. What happens is that every 10 years they open the body for this so-called veneration. I thought this is the right time, about a month back I wrote to the Bishop of Goa and requested him to stop this and send the body to Portugal. We have had enough of this. The history of this man is very bad, there are enough crimes on this account, he seems to be a very inhuman person and I quoted from histories written by experts. I copied to the Conference of Catholic Bishops of India, their President, Vice President. Somehow they did not reply. I kept posting reminders, they never bothered to reply. I wrote to the Government of Goa and the Government of India. • So what specifically did you find against Xavier? Of course, Xavier is venerated, there is even a big college in his name. What specific things did you find? • The Inquisition went on for 250 years, during this period, thousands were massacred, badly tortured. I am a Konkani Catholic from Mangalore. My ancestors were earlier in Goa, due to the Inquisition they migrated to Mangalore. This is our history, it goes back to Goa. What was this Inquisition? I had heard but I did not know that this man Xavier started it. I found a letter from 1545, this man writes to Rome and Portugal King that he wants to start a Holy Inquisition. Prior to that he was in Lisbon, he knew fully well what Inquisition was. He was aware of the torture. Being fully aware of this, he writes to start the Inquisition in Goa, the cruelty was very much in his mind. • But there are people who say that the Inquisition only started after he died, so he shouldn’t be held responsible for all the crimes. • He wrote a letter to the Pope and the Portugal King knowing communication was slow, by sea route, he initiated the process, there are documents that he was taking hourly stock of what was happening, he was personally supervising it during his lifetime. And he initiated it, so he cannot be absolved of his crime. • How would you respond to people in the Church who say he did a lot of service for Christianity? • He has done a lot of conversions. If conversions are in the service of Christianity, then he has done it. But if you consider the humanity angle to it, he was the most inhuman person I find. Even Hitler had some humanity, he was worse than that. • But what did he do in his lifetime that you would call not very human? • In the letter itself he writes, “People here are very bad, their god is black, these people need to be taught a lesson, Holy Inquisition is the only way.” In his mind he is a criminal, that mind is reflected in the letter. I posted this on a forum. I had a friend who is doing his post-graduate at St Aloysius College. He said this is available in the notes given by the Jesuits at Aloysius College, all this is mentioned in the notes, how he benefited Christianity, how he used the sword to convert people. • You are saying this is well-known to the Church? • They know it very well but they are hiding from us. Even when they say they tell from their point of view. They say (of the Inquisition) that these people were so away from God that it was necessary to bring them to God. • So you are saying that a number of ancestors of Catholics on the Konkan coast had to undergo this (torture)? • South to Goa they certainly migrated due to inquisition. It went on for over 250 years. Not only Catholics, there are Hindus, you find Konkani Hindus called Goud Saraswat Brahmins (GSB), there are Kudumbi, Scheduled Castes, and all Konkani-speaking people migrated from Goa due to the Inquisition. • You got no response from the Church. But what about the community, are they receptive? • They are shocked. We have been singing hymns of this great man, it is difficult to digest. Suddenly we learn, history says he is such a big criminal, but our priests never told us, they always said that he is such a big saint. Sometimes they blame me, there must be something wrong with your study. I confront them with evidence. • So are there reputed historians who have documented this? • Yes. Something interesting I will tell you – There is a Konkani paper, the official mouthpiece of the Bishop’s House of Mangalore, Raknno. It has published a long story, a novel, in three volumes, written by one Saldanha [?]. Though the story is supposed to be kalpanic (fictional), the facts were related to Inquisition and all the facts are related to the Inquisition, these are showed in the story. And it is published in the official mouthpiece. • So the story shows the Inquisition … that this was a good thing or this was bad? • No. The entire story was from the Inquisitor’s point of view, it was shown as good, rather as necessary. Because the pagans were to be taught a lesson. But it mentions all the torture, all the burning — this is mentioned. Three big volumes are there. How they were uncultured, needed to be taught a lesson. He has mentioned all the torture parts really clearly. • So what is it that you would like as an outcome here? • The crimes are of such magnitude that you just cannot undo them, undoing or compensating is impossible. The Goa Inquisition was even crueller than the European Inquisition. The least we can ask is the symbol of crime, that is the body, the so-called body, of the man is lying there, and it exposed once is 10 years for so-called veneration, that is like sprinkling salt on the wounds of the victims. At least stop that, you can’t undo the crimes of the man, at least stop this. Send the body back to Portugal. We are no more governed by Portugal. After 1961, we are independent. Till Portuguese were here, we couldn’t demand that. But after 1961, the day the Portuguese left, the body should have gone with them, why it remains here even after 53 years? We have always preached Ahimsa, this symbol of Himsa should no longer be in our country. 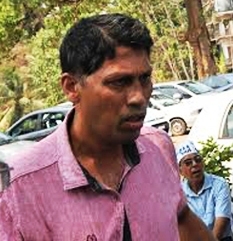 • Goa has a BJP Government, but they have not done anything to bring out the facts? » Sankrant Sanu is an entrepreneur, writer and researcher based in Seattle and Gurgaon. His essays were published in the book “Invading the Sacred” that contested Western academic writing on Hinduism and is a popular writer and blogs at sankrant.org. He is a graduate of IIT Kanpur and the University of Texas and holds six technology patents.